Fu Yamanaka was from the Yamanaka clan like Inoichi Yamanaka. As a skillful Shinobi he is also became the member of Root. He was partnered with Torune Aburame. Fu along with Torune and Danzo battled Tobi (Masked Man) during the Kage Summit. Both Fu Yamanaka and Torune was transferred to the Kamui dimension during the encounter. After sacrificing Torune Aburame for The Summoning of Impure World Reincarnation, Fu was sacrificed to reincarnate Torune. Let’s take a look at the abilities of Fu Yamanaka. Ninjutsu Mind Transfer Puppet Jutsu: At the beginning of a battle and before each action of every round, summon a Puppet (its Life will be based on 15% on the Life value of the original unit).Every unit that causes Ninjutsu damage to the puppet but didn’t defeat it will suffer from Chaos status. Only 1 of these puppets can be created. Ninjutsu “Foundation” Guardian: At the beginning of a battle, generates a Shield to up to 9 Fire or Lightning attributes ninjas from your field base on 30% of this unit’s Resistance base attribute. You can get Fu Yamanaka primarily from the Kage Treasure. 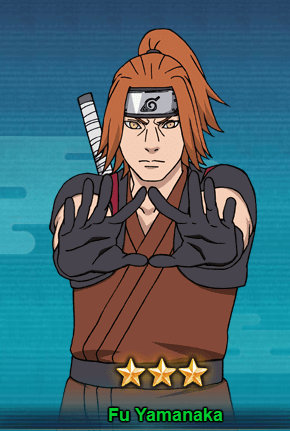 Like other Ninjas like Torune Aburame, you can get him with 10 seal scroll draw from the Kage Treasure.